Influence scenarios are my favorite, both to play and to run, and this one has it all. I absolutely adored playing this adventure and I would happily do so again without credit, if possible. This scenario showcases all the things I come to tabletop for. This scenario was a lot of fun to play, but very heavy on the roleplaying (which is great for some of us, and can be boring for others). It introduces six really important NPCs, all of which are fun to interact with. Despite the premise of this adventure, it doesn’t all come down to social skills. There’s plenty of combat to go around and the NPCs varied interests mean that even the most awkward characters have a chance of impressing someone. The NPCs represent a wide variety of races, which was really refreshing. The social encounters themselves are a lot of fun, and the rules introduced to measure the players success aren’t overly complicated. In addition to the intangible benefits of impressing the dignitaries, there’s also visible, mechanical benefits that occur in the scenario, which are sure to make players pleased. I felt that the investigation part of this scenario was really well done. The clues were subtle, and it didn’t beat you over the head with details, which was refreshing. The final battle allowed for multiple different approaches, methods and tactics, which is nice. Playing this scenario gave a lot of exposition but our party was able to complete this within 90 minutes. We clocked this at two hours, playing Tier 1-2. It's a fun scenario, but structurally unbalanced. Around half the content is in an extended role-play scene that, if the GM or the players don't feel like giving the proper dedication, can be run through in about 20 minutes with complete success. Since the GM has to juggle six NPCs simultaneously, I wouldn't be able to even blame them for it. This is hard. Even dedicating proper time to the interactions will make the scenario run short. However, they are interesting NPCs and taking the time to bring them to life is well worth it – especially since one of them is showing up later in what promises to be one of the standout scenarios of the season. The social influence subsystem is fairly involved, but functional. This is not a scenario that can be run cold. Another noteworthy aspect of the scenario is the finale, which is properly difficult but may also have a few too many moving parts. How the scene works is not entirely intuitive and the villain's skittishness and ease of escape doesn't leave a great deal of margin of error. This latter part, for the record, is not a problem in my book and I enjoy scenarios that allow the PCs to fail without killing them. 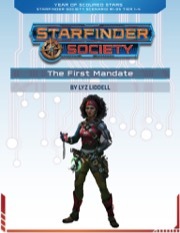 In conclusion, I think The First Mandate's major issue is that it's too short. On the other hand, its structure is sleek and functional and I'm not entirely sure where it could have been beefed up with another encounter. EDIT: Updated to include GMing impressions. 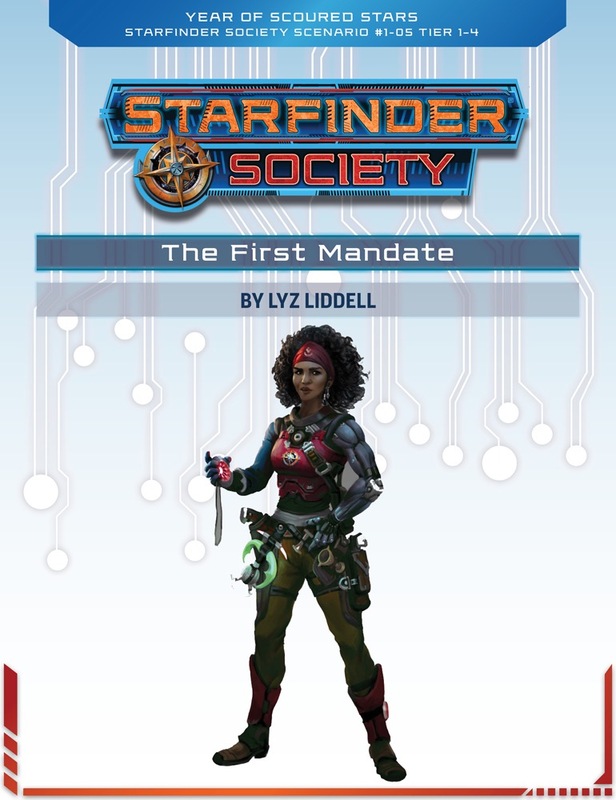 The First Mandate revolves around a gala event celebrating the successes of the Starfinder Society in the wake of the Scoured Stars event. The PCs are invited to take part and help impress the visitors, and of course, things at the gala take a turn for the worse. All in all its a tight concept with some fun interlinking parts, such as the way the people you manage to influence in turn have an effect on later parts of the scenario. This is very cute, and satisfying from a player angle. On the other hand, this scenario really is a test for the GM. If the GM is either not into roleplaying their NPCs, or not capable of handling 5+ different unique personalities simultaneously, a large portion of this scenario can come off as hollow and unimpressive. The write-up provides a lot of useful detail to help the GM, but it really comes down to their RP chops. Furthermore, the latter parts of the scenario are... wonky at best. The events as described don't make much sense and require the group to accept some illogical stuff in order for (cool and dramatic) things to happen as written. Its awkward to execute from the GM's side, and can feel weird and nonsensical from the players' side. Well fleshed out NPC dignitaries for the PCs to interact with. Enough depth to really get some tasty RP going. Each of the NPCs feel distinct and interesting. There's a couple pages *just* devoted to these NPCs in the pdf. Cool concept of finding and unraveling a plot to assassinate the First Seeker. There are a couple of moments that really feel like you're uncovering things yourself rather than being on rails (unlocking the computer and making sense of both the scale shine and hair styling products was the part that really stood out as fun). The "Cinematic" approach can lead to some memorable scenes, with PCs defusing bombs against what feels like a time-limit, or unmasking the culprit! Or even the Obsidian Spider's sweeping Luwazi off an exploding stage if things go wrong! One of my pet-peeves in PFS and SFS is what I call "skill-spam" encounters. The kinds of encounters where what you choose to do almost doesn't matter, but rather you're expected to execute some arbitrary number of skill checks to succeed. There's something soulless in that experience, no matter what kind of narrative glue ties it together. Unfortunately, this scenario has skill-spam in spades, as you have multiple rounds of roleplay and then skill checks by every single player. The roleplay is fun, rolling skills for an arbitrary number of rounds is not. Risking the First Seeker's life in order to show off to some dignitaries makes little sense (especially ironic when considering the Scoured Stars), and full boons for the scenario rely on doing the flashy and stupid tactic rather than the safe one. Well meaning players may not realize what they're missing out on by taking the safe option! This is the big problem: As written, simultaneously finding the bombs and uncovering Triloteya makes no sense. As written, there are no mechanics for actually finding Triloteya. If they know she looks like Sanivvi, do they just automatically spot her in round 1 if they head to the AV room? How would they know to head to the AV room, over, say, the kitchens? Can they ask around to identify her? Why would they even assume she's still nearby? There's no guidance on any of this. Furthermore, if the PCs don't identify her as taking on Sanivvi's appearance (by failing the earlier hacking challenge), there's no guidance in the pdf on how things are different. On top of that, what's the time scale for Luwazi's appearance? If the PCs decide not to touch the bombs at all and search for Triloteya first, there's no tension. Being certain there are only 5 bombs requires OOC information. The whole disarming the bombs scenario makes little sense and assumes the PCs reach conclusions that they have little reason to reach. They have no way to know (in character) that distracting Triloteya is necessary unless they've already found her. And most of what counts as a distraction makes little to no sense... why would Triloteya spend any time paying attention to Zo! for example? All of these elements feel super arbitrary! In my run most of them had to be conveyed to us out of character. Both when I played this and when I ran this, this scene involved a lot of fudging, a lot of OOC "It's just this way because that's how it's written", and a lot of GM improvising to guide PCs back on track. The combats are very plain, with open, unobstructed rooms and few targets. You can have a scenario that minimizes combat but still have fun encounters. These were very basic and pretty dull. First Blakros Matrimony/Hellknight's Feast quest in Starfinder? As you said Roc i'm hoping this will introduce the different major players, Hellknight, Blakros, and maybe the different Planetary Governments of SFS Universe. There's certainly elements of the Blakros Matrimony & Hellknight's Feast in this scenario. We'll also be introducing several new NPCs, each with significance for our inaugural season and beyond. This scenario also acts as the first major "season metaplot" scenario, where we start digging a bit more into the Scoured Stars mystery. Oh! I am looking forward to GMing this one! Heh we managed to soft lock this one. A Solarian, a Soldier, an Envoy, and a Mystic all walk into a scenario. Nobody has computers. At s certain point the GM had to improvise because it wasn't possible to progress the story. It was possible, just hard to find :) You get directions from an orc. A bigger issue is getting the hidden files off of the computer. Without that can you still ID the assassin to split the party and go for both objectives? The conversation with Rhadazam seems to assume that you did and can identify them.. possibly just off of the curly hair in a can? Is it just me, or does it seem there's a few ridiculously high DCs in this? The computers check for one, and the influence checks as well. You need 20 successful influence checks to get the secondary success condition. Seems crazy. Has anyone see a table run where things didn't go BOOM!!! ?